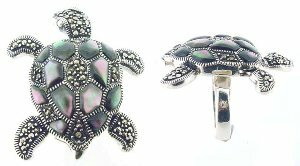 Here's a nice selection of 925 sterling silver turtle ring designs for folks who love these creatures. Some of them are so cute, they'll melt your heart! 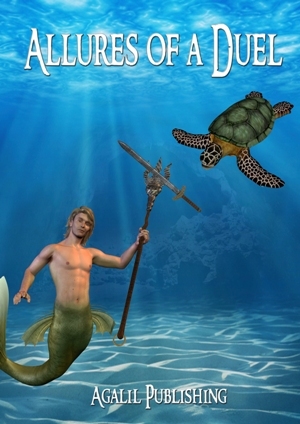 Terrapins and Tortoises are featured as well. 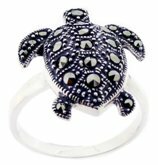 An array of sea turtles are carved and etched right into a substantial 8.5mm wide sterling silver ring band. 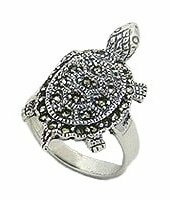 The sea turtles are antiqued for an outstanding effect in this sterling 925 silver sea turtle band ring. 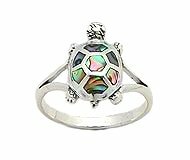 This 925 sterling silver sea turtle and waves ring band looks lively as extra efforts and crafting techniques are employed for added contrast. The waves and turtles are embossed and raised high whereas the background is recessed, etched and textured. This enables the well-polished and shiny turtles and waves to standout and appears spirited. Sky-Blue Topaz, Citrine, Peridot, Emerald, Ruby, Black Sapphire, Garnet, Amethyst. That's the eight gemstones forming the turtle shell. Er... I'm not done yet. Marcasite gemstones line the edge of the turtle shell, surrounding the eight gemstones. Marvelous.  The turtle is 15mm wide and 25mm long from head to tail. 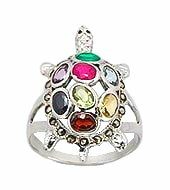 If you keep Terrapins, this ring should look familiar, especially the diamond pattern of the shell. Marcasite gemstones line the edge of this Terrapin and accent the diamond pattern of the shell as well. 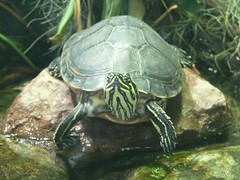 The size of this Terrapin is 15mm wide and 29mm long from head to tail. Naturally, this is a terrific gift for somebody who keeps and loves Terrapins. These two rings are discussed together because they feature Marcasite gemstones from Swarovski. These are premium grade stuff. Ring M321 is a deluxe model in many ways. It is big, measuring 1 and a half inch from head to tail so plenty of silver is used for this turtle. The head and limbs of this turtle are movable! This is one turtle I like to wear as I get to play with it - fiddle its limbs; turn its head left and right so it can find its way about. The final element of this dazzling turtle is matching Mother of Pearl - Pinctada margaritifera. Even from afar, it is noticeable you have something remarkable on your finger. Here's another Terrapin ring with Abalone on its shell. The size of this Terrapin is 10mm wide and 17mm long from head to tail. Tortoise lovers will appreciate this classic tortoise sterling silver ring design. The middle tortoise is bigger than the other two, measuring 9mm long. Baby turtles are so cute! And this one doesn't grow up. 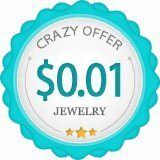 The cutie pie on this turtle hatchling ring is 6mm wide and 9mm long. The turtle shell on this adorable baby sea turtle is fashioned by a rim of oval sterling silver framing a finely polished piece of inlaid black onyx. The cute baby turtle is 9mm wide and 13mm tall.